Easter Island is a cultural experience like non other. You'll walk in the footsteps of the ancient Rapa Nui people, visit several famous archaeological sites, hike to the peak of an extinct volcano, & relax by the clear blue waters of the Pacific on Anakena Beach. This 4-day/3-night tour makes a great add-on to any Chilean or South American adventure. Orongo – Ancient village of the Rapa Nui civilization & site of their annual birdman ceremony. Ana Te Pahu – Cave featuring fascinating geologic formations due to previous lava flow. Rano Raraku – Quarry where the Rapa Nui people sculpted nearly nine hundred moai statues. Welcome to the Polynesian paradise known as Easter Island. Arrive at the airport, & transfer to the hotel. Enjoy the remainder of the day at leisure. In the morning, enjoy stunning views of the island & the Pacific Ocean from the peak of Rano Kau. You’ll also admire the bold, earthy tones of this extinct volcano’s crater lake. Afterward, journey back in time to the age of the ancient Rapa Nui people. Learn about the traditions of the birdman ceremony at Orongo village, see the moai statues at Ahu Akivi, & explore Ana Te Pahu, a cave featuring fascinating geological formations due to previous lava flow. Other highlights include the rock art of the cave Ana Kai Tangata & the Puna Pau quarry. 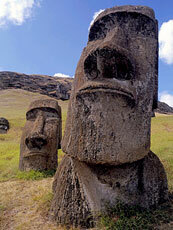 Discover ancient artifacts situated on the southern coast of Easter Island today. See the platform at Ahu Akahanga, which is associated with the legend of King Hotu Matua’s grave. Visit the Rano Raraku quarry, which features the Tukuturi moai statue, & learn about Easter Island & the Navel of the World. Other Rapa Nui site highlights include the platform at Vaihu & the famous platform at Ahu Tongariki. Before dinner, enjoy time of leisure on Anakena Beach.